A system for approximating, temperature, flammable objects, and burnt materials. ThermalFX is build on 3 sub-systems which work in tandem to create dynamic heat, fire, and burning effects. The Energy Manager and member scripts track the state of each member actor, including details like temperature, fuel, conductivity, flammability, burn rate, and global properties like ambient temperature and wind. They are also responsible for radiating heat between member actors in a way that roughly emulates the thermal behavior of black-bodies. A suite of parameterized particle systems driven by script to create heat distortion, flames, smoke, and embers which can interact with the system and ignite other members. Featureing custom flip-books and vector fields of pyro simulations authored in Houdini. 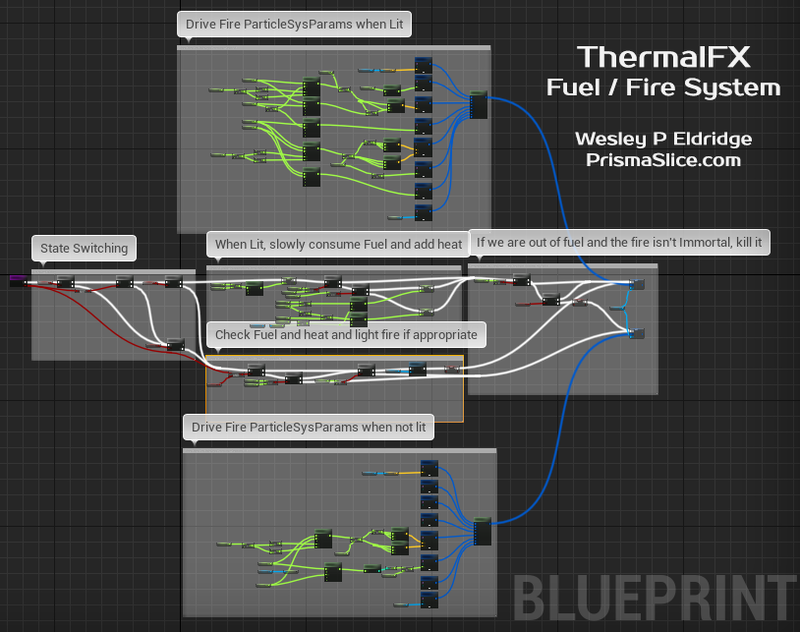 A Substance Designer graph which generates charred and emissive textures based on any mesh or base textures and an Unreal Material driven by script to transition between states based on how burned or hot an actor is. Member properties drive a dynamic thermal simulation for complex heat, fire, and material effects.